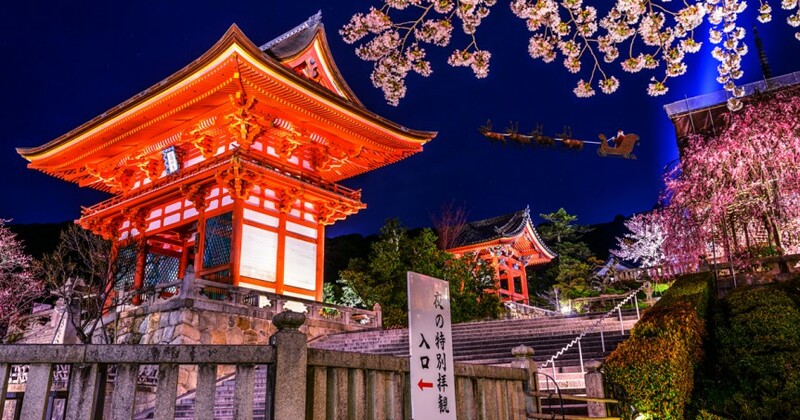 Kyoto, Japan at Kiyomizu-dera Shrine outter gate is illuminated by the night sky as Santa makes his way into Japan. The sign reads, “Special entrance for night visits” and there is not a more special visitor than Santa Claus spreading the spirit and joy of Christmas. On Christmas day the most popular meal is friend chicken and fast food chains like KFC are the busiest that day. For dessert the favorite treat is a Japanese Christmas Cake, made like a sponge cake and decorated with holiday symbols like Christmas Trees and Santa.